On any night in Kailua, one can spot drivers from Pizza Hut, Papa John's and Domino's criss-crossing the two-lane streets, making deliveries to hermit types who like their pizzas hassle-free. Then there are others for whom going out for pizza presents another occasion to socialize. Until recently, Hawaii's first Boston's North End Pizza shop was the only "destination" pizza joint in town, having proved so popular in the early days that they didn't need to make no stinkin' deliveries. Thank you very much. Boston's combination of a chewy crust, oversize portions, light touch with sauces and bountiful garden-fresh toppings were such a welcome and satisfying alternative to the larger chains that I never felt the need to go searching for a better pizza and never imagined anyone might try to compete with them. About a decade later, Mama's Island Pizza has arrived to challenge Boston's standing as a destination pizza joint. Mama's is just different enough from the big chain guys to merit a try, and for those who never really cared for Boston's stripped-down approach, Mama's gets down to business with some serious macho, pig-out grinds. As insurance against the possibility of pizza overload, Mama's puts other items on the menu, starting with "Mama's Famous Chicken Wings" ($7.99 for a dozen, $12.99 for two dozen), inspired by Buffalo, N.Y.'s Anchor Bar. These are deep-fried until airily crisp and golden, with a light coating of hot sauce and your choice of blue cheese or ranch dressing. The sauce doesn't have the fiery sting of the Shack's Buffalo wings, but Mama's wins on texture. The wings are the best things on the menu, beating the namesake pizzas. At Mama's Island Pizza, the "Hey Brah Meat Delight" is topped wtih Portuguese and Italian sausages, bacon, meatballs and pepperoni. Sandwiches here are straightforward. Except for "Mama's Perfect Chicken Sandwich," ($7.99), which comes with lettuce, tomato slice and onions, the sandwiches are essentially reduced to the basics: meat and bread. Kalua pig is slathered with barbecue sauce on one sandwich ($5.99), and while it's a safe bet for those who like the blend of pork and standard barbecue sauce, I preferred the sauce-free "Ono Meat Ball Sandwich," ($5.99). The grayish meatballs -- four lined up inside a 6-inch baguette -- weren't very pretty to look at, but the flavor was of spiced sausages without all the unwanted gunk, grease and fat. The sandwich proved to be aptly named. Mama's is a small, efficient, self-service kind of place where you walk up to the counter to order, returning to pick it up later. It's best to grab a takeout menu off the counter rather than try to read the fine print on the menu boards, the result of trying to cram so many items into a small space. Napkins, extra sharing plates and shakers of red pepper flakes and Parmesan cheese are placed near the soda machine so you can grab everything you need before chowing down. It's kid-friendly during the day and early evening, but you should probably put Junior to bed before heading out on a Friday or Saturday night, when beers are $2 after 9 p.m.
By day you can get a 9-inch cheese and one-topping pizza for $6.99 ($7.99 gourmet version). Other sizes are 12-inch for $14.99, 14-inch for $17.99 and 16-inch for $19.99. Adding additional ingredients will each cost 99 cents, $1.59, $1.79 or $1.99 for the respective sizes. All the basic toppings are covered. Sorry, I didn't see anchovies, though. But you got your pineapple, ham, smoked gouda, chopped garlic, green onions and kalua pig. All this goes onto a hand-tossed hearth-baked crust that ends up chewy but with a lot of crunch, thanks to a generous sprinkling of cornmeal across top and bottom. 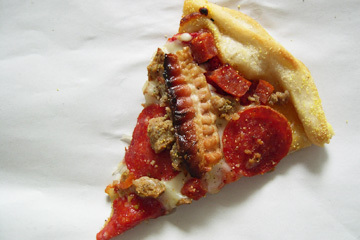 The crunch is the best part of the pizza. 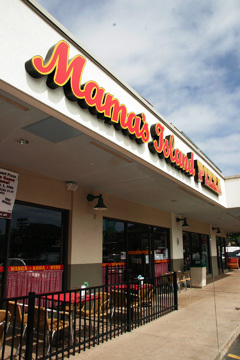 If you don't want to build your own combo, Mama's offers five gourmet pizza specials at $7.99, $16.99, $19.99 and $22.99 in the respective sizes: "Pig Out Deluxe" of the BBQ kalua pig mentioned above; an "Island Veggie Spectacular" with the entire list of veggie toppings; "Kama'aina Chicken Special" with chicken, red onions, smoked gouda, mozzarella, cilantro and BBQ sauce; "Kailua Supreme" with pepperoni, Italian sausage, mushrooms, green pepper, onions and cheese; and the "Hey Brah Meat Delight" with diced Portuguese sausage, pepperoni, Italian sausage, strips of bacon, meatballs and extra cheese. After this, you won't need dessert, but if you do, pick up one of the Lanikai chocolate chip cookies ($1.39) at the counter. You can always eat it later.